We had quite a heat wave the last two days. Today was the worst, so hot I felt like bread baking in an oven. I didn't want to eat or cook anything heavy. I didn't want to cook, period. But, I had a taste for fresh corn and tomatoes. Lately, I crave them, perhaps because I sense the end is near. Soon, the days of fresh picked tomatoes and corn will be over until next summer. 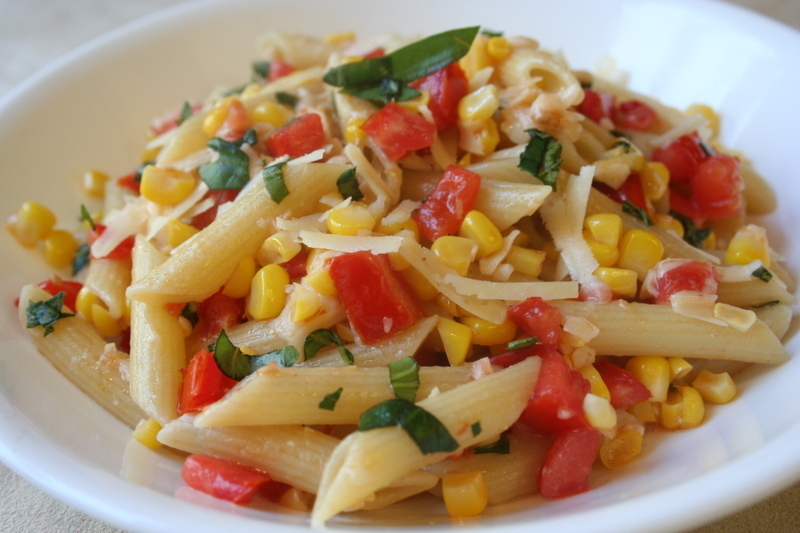 That will be a sad thing, because I won't be able to fix a salad like this Pasta Salad With Corn And Tomatoes. Beautiful to look at and full of flavor, this was a delight to eat. I'm submitting it to Presto Pasta Night, which was created by the marvelous Ruth at Once Upon A Feast. Check Ruth's site starting Friday, when she will begin compiling her Roundup of pasta recipes from bloggers all around the world. Time sure flies. 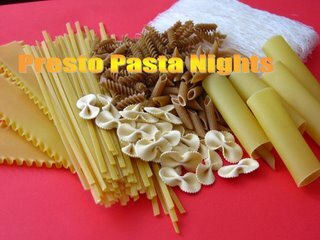 Six months ago, Ruth at Once Upon A Feast started a blogging event called Presto Pasta Night. As I recall, Ruth was unsure if it would be a success. Well, baby--look at you now! Each Friday more and more bloggers from all over the world gather together at Ruth's roundup, where you will find wonderful pasta recipes. I wanted to make something special for this week, and thought about making ravioli from scratch. But, I have my own event taking place right now. I'm a wildlife rehabilitator and have six baby squirrels right now, at different developmental stages, including a newborn who fell out of his nest two days ago. Right now I spend my time feeding the squirrelly crew all day and night. I look pretty bad, with baby formula, (and worse) splattered all over my clothes. So, I decided to make something quick, but cheerful. 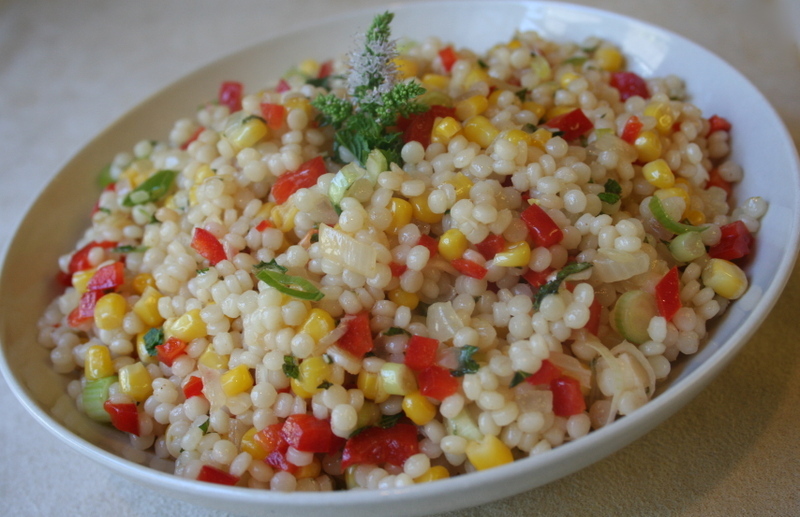 I love Israeli couscous. It tastes wonderful, and the round shape is fun to look at. This recipe from Food & Wine Magazine is very colorful and reminds me of a bowl full of confetti, just right for a celebration. It's Julia Child's birthday today, and last year Lisa at Champaign Taste had the great idea of celebrating by asking people to prepare a Julia recipe. Last year I did a Cobb Salad, which was so good, I still think about it. That salad took hours to make, and I did quite a bit of swearing during the process. 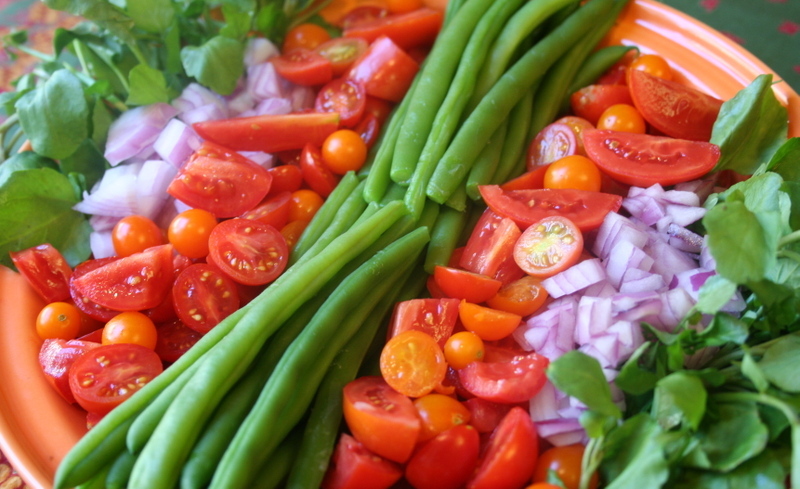 But this year, I made a very simple salad of green beans, tomatoes, and watercress, which took very little time. It was delicious, and I liked that it shows Julia Child recipes are not all rich, laden with cream, or difficult. 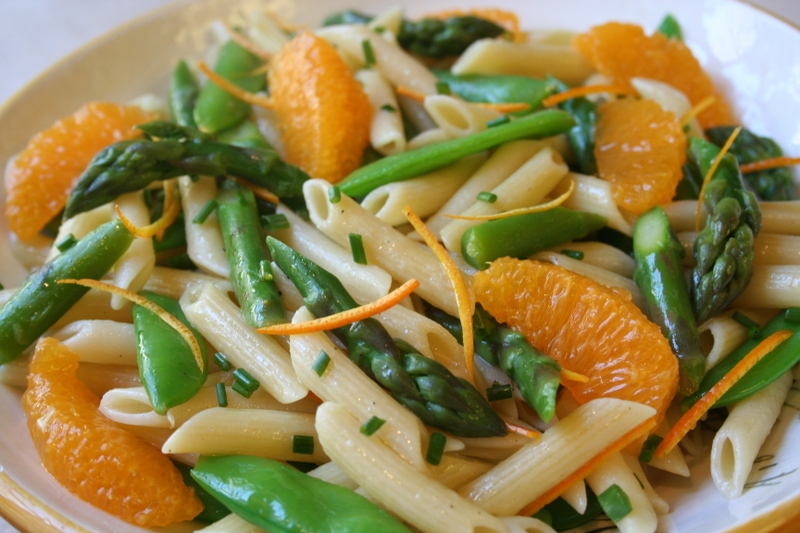 Second, it features blanched green beans, which I learned to do from watching Julia on TV, back when I was a teenager. Until then, I hated eating green beans, which were usually tasteless, gray, and mushy. What a revelation it was to taste beans cooked for only 4-7 minutes, with a bit of crunch left in them, then plunged into ice water to set the color. It's still one of my favorite things to eat, tossed in butter, with chopped herbs. 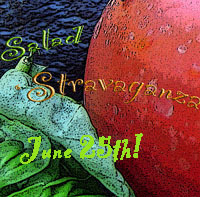 Lis at La Mia Cucina and Kelly at Sass And Veracity hatched the idea of a Salad Stravaganza for this month and I promised to submit something before the deadline of June 25th, and it appears I have managed to make it just in time. Lis and Kelly are on a quest to acquire smaller hips, a very noble idea, don't you think? 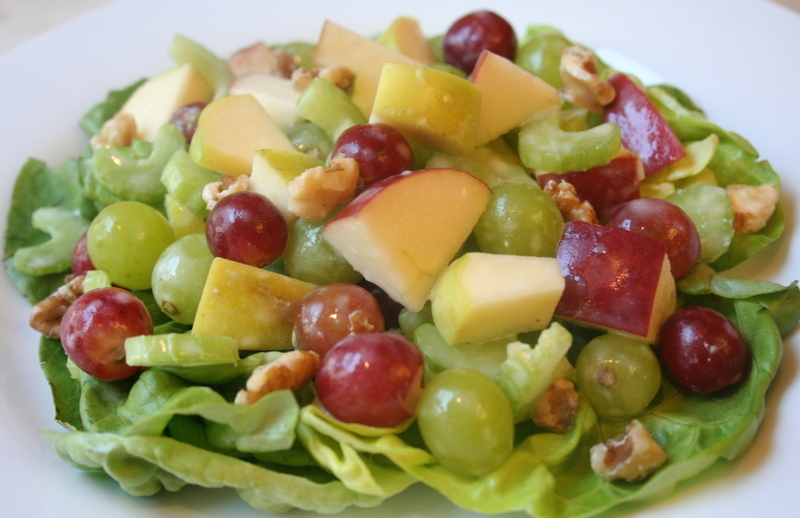 This is an extremely easy salad, but getting the right ingredient may or may not be easy for people. It's a tomato salad that must be made with the best quality fruits (or you can call them vegetables, if you like). If you're lucky enough to grow your own, by all means use those. But, excellent specimens are starting to appear on the market. And for those still waiting--your time will come. Really, it will. 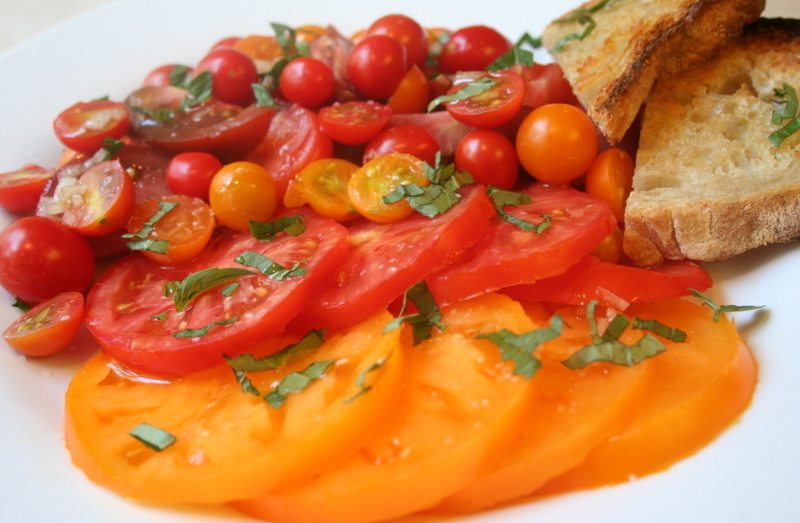 The waiting period for vine ripened tomatoes makes them all the more delicious when you finally taste them. So just keep telling yourself that, as you wait impatiently for them to finally arrive in all their perfection. The new issue of Food & Wine arrived with a photo of a big bowl of cole slaw. 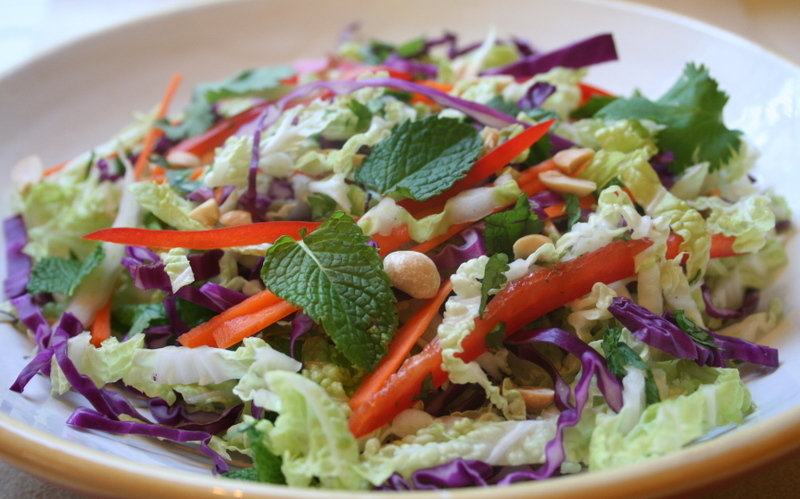 Asian-style cole slaw, with a dressing that included fish sauce, garlic, lime juice and Sriracha. 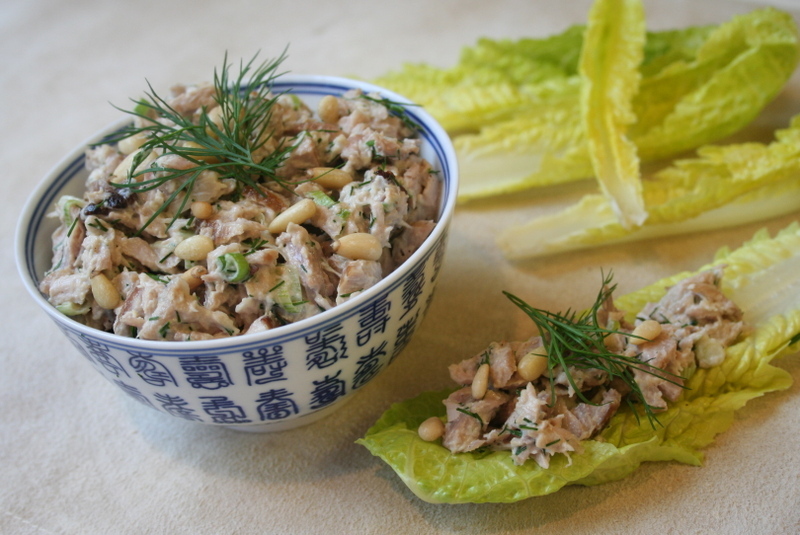 I love Asian salads, so I immediately began thinking about it. On Friday I assembled all the ingredients and was thrilled with the result. It was crunchy, silky, chewy, sweet, sour, tangy, and hot. 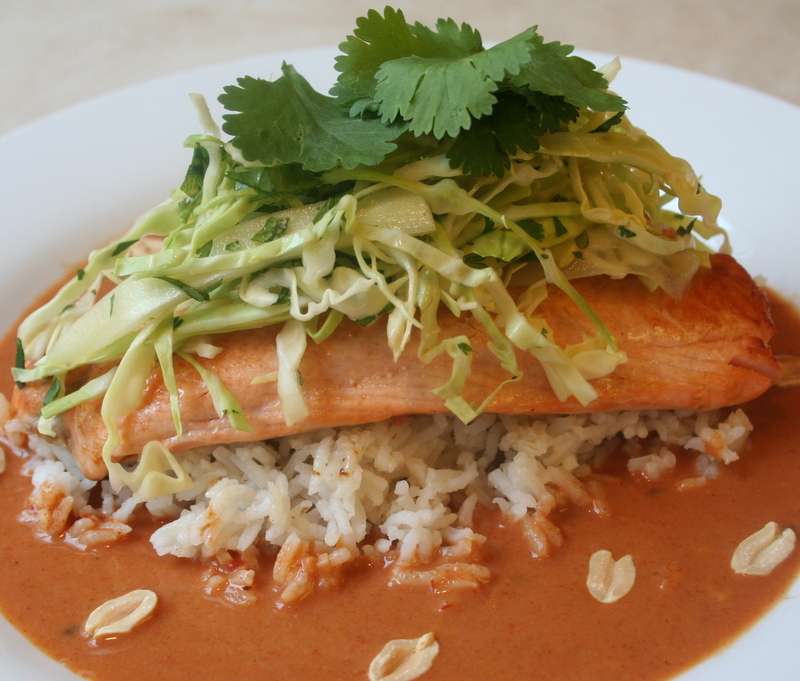 The heat came from the marvelous Thai chili sauce called Sriracha. You can limit the amount so that it doesn't impart much heat--or you can go all out and blast a hole in your sinuses. 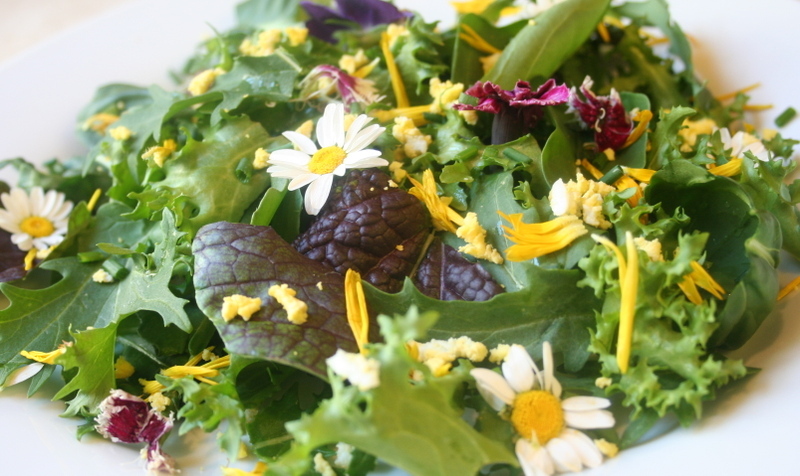 This dish is perfect for Weekend Herb Blogging, the brainchild of the delightful Kalyn at Kalyn's Kitchen. This week it's being hosted by Rachel at Rachel's Bite. Please go to her site and see all the marvelous Roundup of herby bloggers.